James Frew Ltd are recruiting for a Plumbing apprentice. A Plumbing Apprenticeship is a Modern Apprenticeship where apprentices receive training in all aspects of plumbing and heating. Modern Apprenticeships are a combination of work-based and college/training centre training. An apprenticeship gives you the opportunity to earn while you learn, providing the dual benefit of gaining a nationally recognised qualification whilst being paid as you work. Over the course of your four year apprenticeship, you will work to achieve the SVQ level 3 in MES Domestic Plumbing. The apprenticeship will involve classroom based training at West College Scotland (Paisley Campus) and on site based training on our contracts in and around Glasgow, with an experienced plumber who will be your mentor. Ongoing training and assistance will be provided during the apprenticeship at our Stevenson Training Centre. The work experience will take place at various locations so a degree of travel will be required. A company uniform and full PPE will be provided. On completion of the apprenticeship you will have an opportunity to join the company as a fully qualified Plumber with great careers prospects and ongoing development. Preferably all applicants should have achieved NAT 4 or above in Maths, English, Science and / or a Technical subject, however, these are not essential. Be a hard worker with a technical mind and positive attitude. Must be between 16 -19 yrs old. 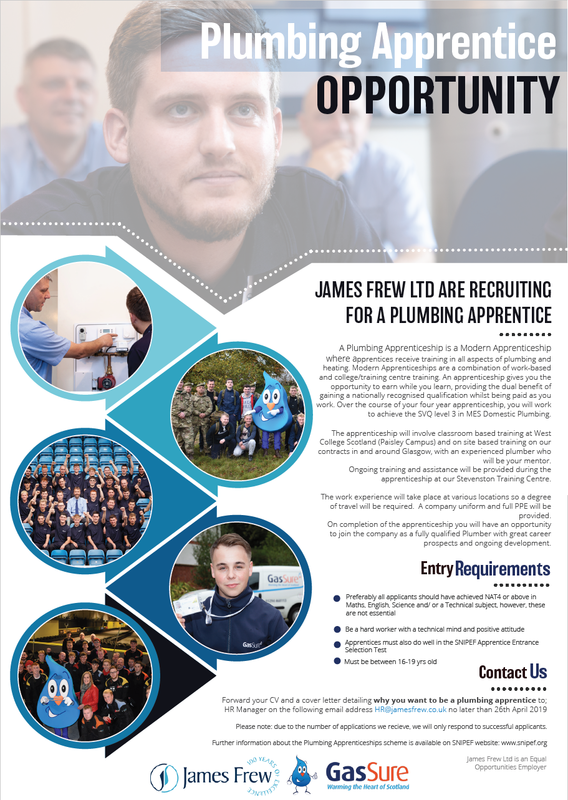 Applicants must forward their CV and cover letter detailing why they want to be a Plumbing apprentice to: HR Manager on the following e-mail address: hr@jamesFrew.co.uk no later than 26th April 2019. Please note: due to the number of applications we receive we will only respond to successful applicants.